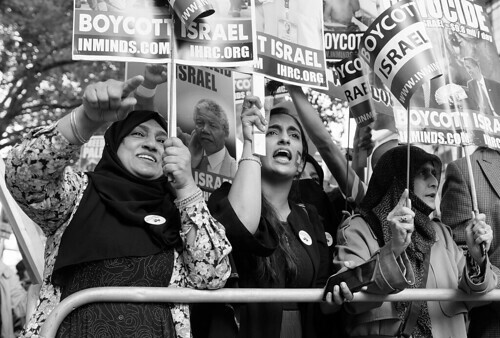 Participants in London's Al-Quds rally call for people to boycott Israel until the Palestinians are given their freedom and a just settlement. Several thousand people, including many women and family groups, had gathered to express their support for the Palestinian struggle for justice and self-determination on Al Quds Day, which is held annually around the world and in central London. Despite the threats from far right extremists to disrupt the march, the numbers attending were high with barely any space to move in Curzon Street, Mayfair, where the rally assembled for the opening speeches. A stretch of the street immediately in front of the Saudi Embassy had been chosen, due to the monarchical regime's tacit and often open support for Israel's occupation and its crushing of all Palestinian opposition. Israel enjoys a huge diplomatic and strategic advantage, having obtained the support of the US/UK backed neighbouring Arab dictatorships in Saudi Arabia and Egypt. Many on the rally were also angry that the UK is exporting arms to Israel, even though it continues to defy international law by imposing a brutal blockade on Gaza and building illegal settlements on Palestinian land while at the same time its army uses lethal force against unarmed protesters. Although there is overwhelming evidence of Israel's persistent violation of Palestinian human rights, the UK government has exported 445 million dollars worth of military equipment to the country since 2014, including components for fighter aircraft, helicopters and sniper rifles. It is obvious that it is Israel which is the rogue state, not just by refusing to comply with international law but also by killing protesters who clearly present no danger, but the "mainstream" British media portrays opposition to the Israeli occupation as the problem blaming Hamas, Fatah, Hezbollah and even the Al Quds march in London. Editorials insisted that the rally was a provocative and extremist event due to the presence of Hezbollah flags, however the papers felt no similar need to criticize the flying of Isreali flags representing a state which has murdered over 130 Palestinians in the last two months, including nurse Razzan al-Najjar, two journalists and several children, as well as injuring 3,600 with live ammunition. Nor, for that matter, had there been more than a few token critical comments when Israel's prime minister Netanyahu, directly responsible for the killings, visited Downing Street for tea on the previous Wednesday. Among the supposedly more progressive newspapers the Guardian refused to publish a drawing by its own cartoonist Steve Bell which depicted nurse Razan as one of the victims of the meeting, claiming that the depiction of Razan burning in Number 10's fireplace was anti-semitic. The casualty figures during the recent shootings clearly show how Israel's use of lethal force is entirely out of proportion to any marginal and highly limited use of force by those besieged in the Gaza enclave. Not a single Israeli soldier has been injured during the targeting of Palestinian protesters and one of the Palestinians killed, Yasser Murtada, was a well respected journalist who had previously worked for the BBC, and was clearly wearing a PRESS jacket at the moment he was shot in the chest by a carefully aimed sniper's bullet. Another was Razan al-Najjar, a 21 year old Palestinian medic, who was wearing her white medic's uniform, an identification tag and had her arms raised high in the air at the time she was fatally shot in the chest. Both were killed some distance from the illegally erected border/prison fence which isolates the population of Gaza from both their family relatives and any chance of gainful economic employment in wealthier areas. That's why the popular anology which compares Israel to South African apartheid is highly misleading because in South Africa, at least the white population needed the blacks as workers, even if they committed appalling atrocities, but in Israel the Palestinian population are neither needed nor wanted by Israeli employees. Palestinians are treated worse than dogs, to whom humans tend to show some sympathy, but rather as unworthy of any consideration, so much so that past Israeli military operations against Gaza in which the planners know thousands of civilians are likely to die are given the military term "mowing the grass", because the Palestinian civilian population is considered of no more value in importance, than the ants one might tread underfoot when one ventures into the garden.